For the disabled community, the smart hub has a variety of options that could assist them based on their impediment. For the hearing impaired, Matilda can directly relay messages to their hearing aid to keep them informed on the arrival of their vehicle. The system can also communicate using sign language to people who use it. An image of a person will appear on the screen, and the user can interact back and forth with each other using sign language. Matilda first surfaced publicly at the Consumer Electronics Show 2018, where it was put up to demonstrate how technology could make the world more accessible for the elderly and the disabled. Palmer explained that the responses were very positive, with disabled people praising the product and saying that it was an answer to a lot of problems that the community faces when it tries engaging with public transport. The initial response to Matilda across Adelaide has been endearing as well. Palmer mentioned that the idea is to expand the solution across smart cities that promote self-driving vehicle programs, as they are the first movers for the futuristic technology. 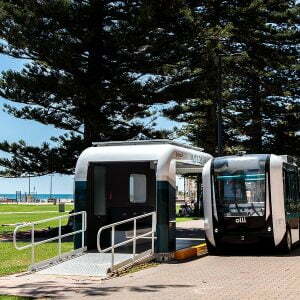 “We will also promote the product in smart cities where there’s an interest in getting more of the community to engage with public transportation,” said Palmer. The system can also communicate using sign language to people who use it. An image of a person will appear on the screen, and the user can interact back and forth with each other using sign language.